This year, the ALC was privileged to snag Mr. Alan Albright as the teacher for the Teacher Education class. This is the first year we are offering this class, and the teacher for it couldn't be a better fit. Mr. Albright brings so much enthusiasm and energy to his class, that the students love to be there every day. We knew that Alan Albright had experienced many things in his life but we were somewhat shocked to learn just how many things he has accomplished thus far. Alan Albright was a 2 time California State Champion. He was a high school National Freestyle Wrestling Champion and then took 3rd in the world 1971 in Tokyo, Japan. He went to college and received the All-American Wrestler at Oklahoma State University. 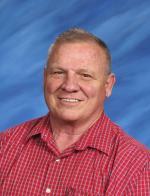 Mr. Albright coached Spanish Fork HS to 1st State Wrestling Championship. He was named HS. Coach of the Year 1984. Was on the East-West Allstar team. At BYU, the teams won the Western NCAA Regionals, Private University National Championship and named Nat'l Private University Coach of the Year along with teams being the #1 Academic team in the Nation. He was inducted into the California Wrestling Hall of Fame in 2016. He is married to his beautiful wife, Calleen. Together they have 5 children with 33 grandchildren and 1 great-grandchild. Those who know Alan, know that he is an avid genealogist. WE ARE SO HAPPY TO HAVE MR. ALBRIGHT ON OUR ALC TEAM. Jim Stuart- HS history teacher and longtime friend.